Today is another 100 degree day. I took Henry to the public pool with a friend and her baby. It was really fun. Henry is learning to splash around. I have to keep him slathered in lotion though. After the pool he was tuckered out. During his nap I did some new drawings. Here’s one of them. Beautiful use of watercolor. 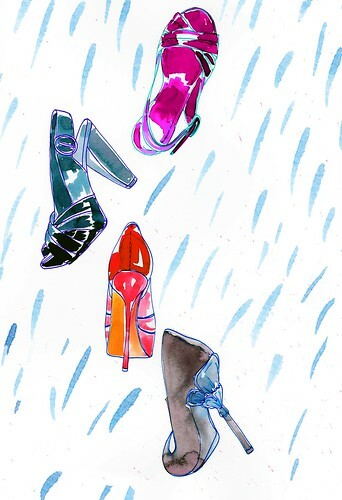 Oh yes…I WISH it was raining shoes!!!!!!! L I K E !